When it comes to enterprises adopting the cloud, ultimately it’s a matter of trust, according to a recent study released by Intel Security, which found that over the next 12 to 18 months, most of enterprise IT’s budgets will be spent on public cloud resources. The U.S. government doesn’t have the budget, while the United Kingdom in general is constrained by high real estate costs that influence the budgets for both building and maintaining data centres, said Montgomery. Meanwhile, countries such as Germany and France encounter higher costs due data sovereignty and privacy rules. Average number of months until 80 per cent of the respondent organization’s IT budget will be comprised of cloud computing services, split by country. Intel Security’s survey found that the vast majority of organization’s IT budgets are being spent on cloud services in less than a year and a half, and even faster in some countries, with Canada falling line with the average time span. 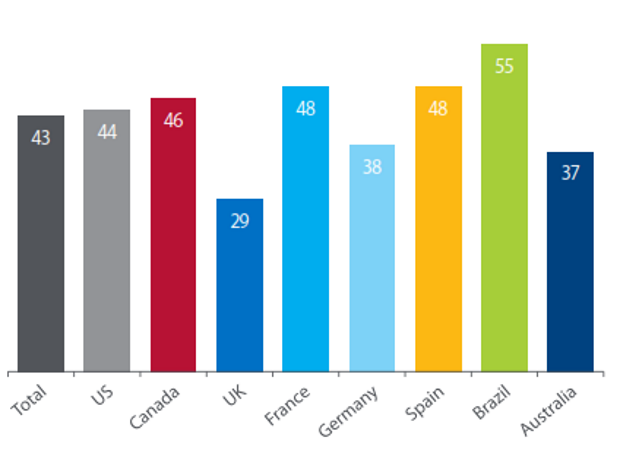 The migration will comprise both public and private cloud, with private the most dominant at 51 per cent. 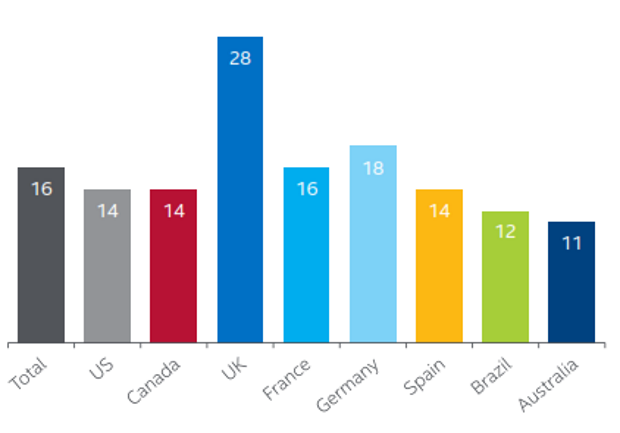 The average number of cloud services organizations are currently using, categorized by country. There will be differences in the rate of adoption of different types of cloud platforms, be it public, private, hybrid and managed, as well SaaS, IaaS, PaaS. Anecdotally, the Intel Security survey found it differs from sector to sector, with financial services being more cautious and government generally lagging behind. Which cloud deployments does your organization plan to invest in? 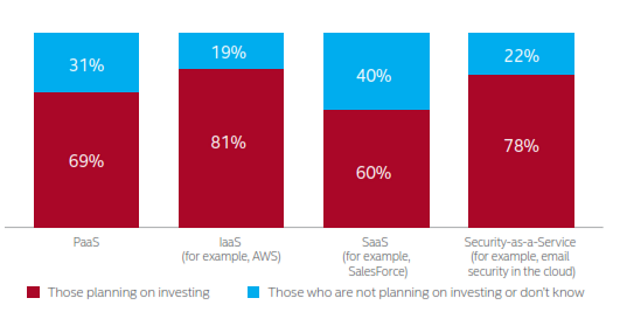 The survey found that the majority of organizations are planning on investing in all cloud service models, with the highest percentage going IaaS not SaaS anticipated. With regard to cloud security, what issues has your organization had with cloud service providers? Intel Security’s survey suggests that it’s time for a re-evaluation of what the real cloud threats are, as there is evidence of a gap between perception and reality. 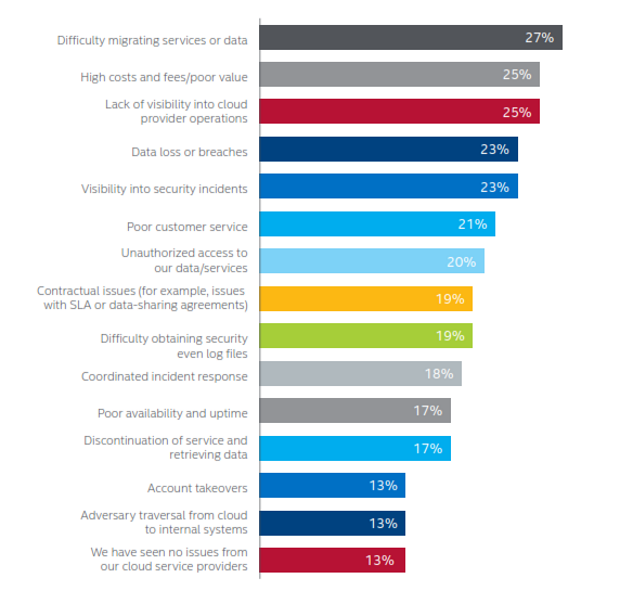 In most countries the main concern around using SaaS is data security incidents, with data breaches also the top concern for IaaS and private clouds, but the most common incidents and issues that respondents had with cloud services were actually migrating services and data, high costs, and poor value or lack of visibility into the cloud provider’s operations. Do you think your senior management/executives understand the security implications of storing sensitive data in the public cloud? 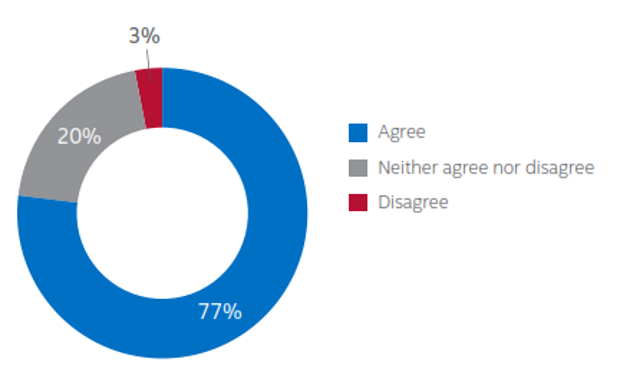 Intel Security’s survey shows a high level of involvement in cloud security decision-making by senior management—not just the IT director, CIO, and to be a perturbing gap in board-level awareness of the security implications of storing sensitive data in the public cloud, with only 34 per cent of respondents saying senior management in their organization fully understands the implications. To what extent would you trust the following to keep your organization’s sensitive data secure? Not surprisingly, the survey found that the public cloud is the least trusted model. Despite concerns over the security of public cloud, the bigger picture shows an overall growing level of trust in cloud computing over the past year, with 77 per cent of enterprises saying their organization trusts cloud computing more now than they did a year ago. Which areas of Security-as-a-Service does your organization plan to invest in? Intel Security’s survey found that security investment priorities vary across the different types of cloud deployments. Enterprises are using an average of three security solutions to protect their SaaS applications; for, IaaS, they are using an average of four. Meanwhile, the top four areas of Security-as-a-Service that organizations plan to invest in are the same ones they are already investing in: email protection, web protection, anti-malware, and application firewall.